Some Democratic candidates for president are already spending furiously to saturate Facebook with ads as they race to qualify for the first debates this summer. Others are carefully husbanding their resources, banking cash in hopes of unloading it in a burst as the primaries near. Then there is Elizabeth Warren. Ms. Warren, the Massachusetts senator, has amassed a campaign staff of more than 160 in her first three months as a candidate, dwarfing her rivals. Her campaign is gambling that placing organizers in the early-voting primary states now, particularly in Iowa and New Hampshire, will pay dividends politically next year. Ms. Warren raised more than $6 million in the first three months of 2019, the fifth-most in the field, according to federal filings disclosed on Monday. But she churned through that money almost as fast as it arrived, pouring nearly 87 cents of every dollar raised back into spending. The filings provided the most detailed look yet into the wildly divergent ways the Democratic candidates are constructing their campaigns. The report also cleaved the crowded field into two: the financial haves and have-nots. 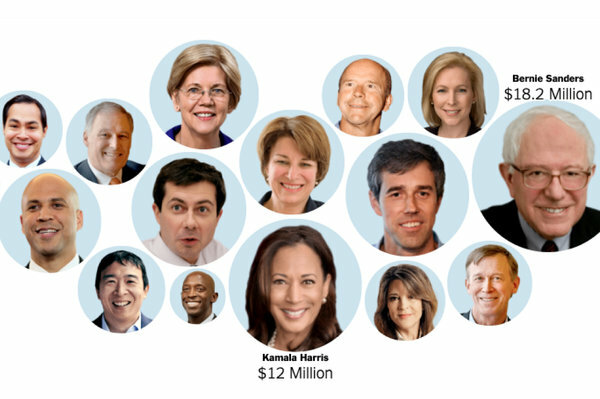 Presidential candidates offered a long-awaited rundown of their campaign finances, an early barometer of strength and staying power in the huge Democratic field. Nine Democratic candidates entered April with at least $6 million in the bank (though some got there by transferring money from old Senate campaign accounts, and one, former Representative John Delaney of Maryland, lent millions of his own dollars). Six others had less than $2 million and one had $2.8 million. The contrasts in spending were just as stark. In the first quarter of 2019, Ms. Warren spent more on payroll taxes than Mayor Pete Buttigieg of South Bend, Ind., spent in total, other than the fees his campaign paid for processing online donations. Mr. Buttigieg, a 37-year-old newcomer to the national political scene, spent less than 10 percent of the $7 million he raised. His fund-raising total topped those of a current governor, a former governor and four United States senators. “I think I’ve gone from being viewed as, you know, adorable six weeks ago to now plausible,” Mr. Buttigieg said Tuesday on CNN. The Democratic pacesetter for fund-raising remains Senator Bernie Sanders of Vermont ($18.2 million raised), trailed by Senator Kamala Harris of California ($12 million) and former Representative Beto O’Rourke of Texas ($9.4 million). Mr. Sanders and Ms. Harris are using their funds to hold more highly produced — and costly — events. Mr. Sanders spent $626,000 on what his campaign categorized as “event/sound/staging” expenditures. Ms. Harris spent about $500,000 on her January kickoff rally in Oakland, Calif., where she drew an estimated crowd of 20,000 that helped intensify interest in her candidacy. Former Vice President Joseph R. Biden Jr. has waited on the sideline as the race has developed. But his delayed entry comes with a future financial cost: Mr. Biden would have to raise $100,000 a day for two months just to match the $6 million currently held by the ninth-best-funded candidate. Patti Solis Doyle, who served as Hillary Clinton’s campaign manager in 2008, said campaigns that burned through funds quickly, like Ms. Warren’s, needed to be sure they could continue to raise money. Senator Kirsten Gillibrand of New York also spent more than 80 cents of every dollar she raised; she collected $3 million, about half of Ms. Warren’s haul. Ms. Warren and Ms. Gillibrand both transferred huge sums ($10.4 million and $9.6 million) from their Senate accounts to jump-start their presidential bids. Ms. Solis Doyle recalled that Mrs. Clinton’s 2008 campaign had done the same. But she warned that such spending also came with risk. Kristen Orthman, a spokeswoman for Ms. Warren, said her campaign was being “built to last.” The Warren team is continuing to hire more organizers, including in Nevada and South Carolina, even with a payroll already roughly double that of Mr. Sanders and far more than that of Ms. Harris, who has a little over 40 people on staff. “We have front-loaded a tight-knit team and set our organizational plans, priorities and culture faster and in finer detail than anyone,” Ms. Orthman said. Many candidates spent significant sums buying online ads, in part because the Democratic Party has made having 65,000 donors one of the ways to qualify for the official primary debates. The biggest expense for Senator Amy Klobuchar of Minnesota was $625,000, paid to a digital company for “list acquisition.” Gov. Jay Inslee of Washington put more than half his spending, about $450,000, toward buying digital ads. Digital ads also made up a sizable share of spending for candidates who easily topped the 65,000-donor threshold. Mr. Sanders spent $1.5 million on digital ads, Mr. O’Rourke spent $1.25 million, Ms. Harris spent $1 million and Ms. Warren spent nearly $900,000. President Trump’s campaign and his joint fund-raising committees with the Republican National Committee continued to outspend Democrats online, particularly on Facebook, where they have spent $4 million this year, ad records show. Mr. Trump continues to direct campaign spending toward businesses that he is linked to, a practice that has drawn criticism. Among his $378,000 in such spending was $215,000 for space at his Mar-a-Lago resort in March and $112,000 in rent to Trump Tower. The fund-raising reports also offer new details on the donors whom the candidates are raising money from. Mr. Sanders overwhelmingly received money from donors who gave less than $200 (84 percent of his total money raised), as did Ms. Warren (70 percent). Both have sworn off attending the kind of closed-door fund-raising events that have long been a staple of the presidential circuit. Ms. Gillibrand, Senator Cory Booker of New Jersey and former Gov. John Hickenlooper of Colorado were most dependent on larger contributors, with small donors contributing less than 20 percent of their money raised. Ms. Harris led the field with $7.6 million collected from contributions over $200, eclipsing her nearest competitor in that category by more than $3.3 million. She raised approximately $3.9 million from donors who gave her between $2,700, the maximum contribution in the last election cycle, and $2,800, the new legal limit. Mr. Buttigieg raised $2.5 million from larger donors in the first quarter. Several connected fund-raisers, including Orin Kramer, a longtime fund-raising bundler and hedge fund founder, have recently signed on to help Mr. Buttigieg. Raising money from large donors typically gets harder for all but the top-tier candidates as the campaign progresses.